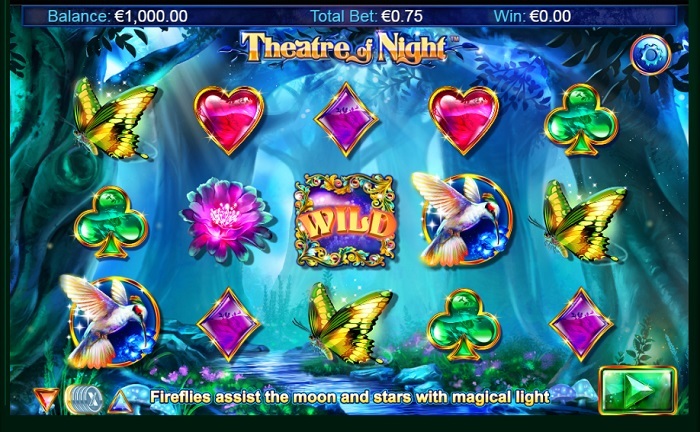 Theatre of Night is a mysterious online pokie set within the confines of a moonlit forest. While dark, imposing trees are all around, the bright and colourful birds, butterflies and flowers come out to play. The reels feature white hummingbirds, butterflies with distinctive green and black colouring and wild flowers in vibrant blue and purple shades. Look out for those fireflies too, who appear in the feature and ensure some incredible winning opportunities. It might be night, but this NextGen Gaming-designed slot sure shines bright. Theatre of Night is an eye-catching and atmospheric gambling machine, with a wild-filled re-spin feature. The mysterious woodland setting, where a combination of the moonlight and the wildlife, add light to the nighttime setting. Five reels and 10 win-lines that pay from left to right. Wilds substituting for any other symbol in the game, while also activating the main feature. Land wilds on reels 2, 3 and 4 and enjoy six re-spins, where wilds can be everywhere! This NextGen Gaming-designed features an unusual way to activate a feature. Normally, you’ll find a scatter symbol, but here, the feature is activated by the wild. This wild appears on reels 2, 3 and 4 during the base game and you’ll need to land it on each of the three reels to enter the feature (with three wilds on the reels, there is a good chance that this activating spin will be a big payer anyway!). On entering the feature, you’ll be awarded with six re-spins, although they could just as easily have been called free spins, as they act in exactly the same way. The feature starts with a firefly moving across the reels and then turning reel three completely wild – which will remain in place throughout the six spins. This is not the end of the story, however, as at any time during the feature, the firefly can turn another series of symbols wild, too. This won’t happen every spin, but when it does, it wouldn’t be a surprise to see more than half the reels filled with wilds. The wilds can appear on all five reels during the feature (as opposed to just three in the base game). These wild-filled spins can be huge payers, so don’t be surprised to see a mega win or two. Line up five wilds in a row and you’ll win the biggest prize of the game – 750 coins. With wilds only on all five reels during the feature, this win is only available then. Theatre of Night features the 5×3 reel configuration that is so popular at online casinos right now. Surprisingly perhaps, the game only plays host to 10 win-lines, a much lower number than many other slots with a similar set up. While this might offer less excitement perhaps, it does offer the opportunity to enjoy more spins for your money, which will appeal to many players. The hummingbird is the highest paying standard symbol, worth 400 coins for the maximum five in a row. The flower and the butterfly are the mid-paying symbols, each worth 150 coins for five in a row. At the low end of the pay table, there are the playing card suit symbols – hearts, clubs, diamonds and spades. NextGen Gaming have created a game with a relaxing nature in Theatre of Night. The woodland setting is perfect and creates a fairytale or fantasy type of scene – the only thing missing are fairies and dragons. The large looming trees are enveloped in blue light, while the lights of fireflies speckle the air. The ambient soundtrack that plays throughout only adds to the relaxing theme of the game – this is certainly a game to play if you’re feeling stressed. You’ll be calm in no time. Will Theatre of Night Illuminate your Bankroll? Theatre of Night from NextGen Gaming would never be considered a fast paced or all-action online slot. This game is all about nature and the calm that nature brings. The visuals are excellent throughout, where the combination of the light shows, and the colourful symbols is a delight on the eye. The game play itself is enjoyable, if not offering too much variety. The base game is a straightforward, while the re-spin feature can be incredibly rewarding, especially when the firefly does its work.